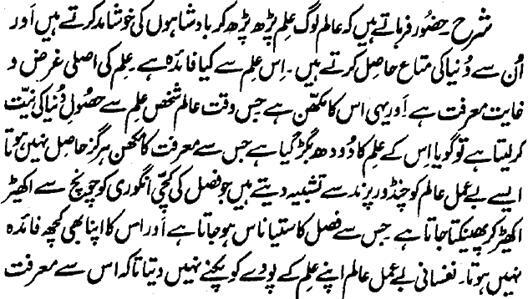 Here Hazrat Sultan Bahu Rahmatu-Allahe Ta-aala Alaihe says that the Ulema read so much Ilm, flatter the kings, and get from them the stuff of Dunya (World). What is the benefit of this Ilm? The real intent and aim of Ilm is the Marifat and this is the very butter of the Ilm. The time, when the Aalim intends to acquire Dunya (World) by means of Ilm, it means as if the milk of his Ilm has spoiled which cannot yield butter. He resembles such Bey Amal Aalim with 'Chindori' bird that eliminates the nursery of a crop by its beak and throws the seedlings here and there. In this way, it destroys the whole field and this action of it gives no benefit to it even. The sensual Aalim, who does not act upon that which he has learnt, he does not let the plant of his Ilm become mature so that he may get the fruit of Marifat from it and instead spoils this plant in immature stage. A Jaahil servant is better that such Aalim, who earns Sawaab of many years' worship in a breath just by serving some Kaamil Broken Hearted Person! Unless you serve the extraordinary special Saints!